Wow. It’s hard to sum up an amazing evening in one blog post – but we’ll try! Last night, 9 amazing chefs joined forces at Area Four in Cambridge, MA to serve up so-called trash fish to more than 125 people. The night began with passed appetizers from Larry Leibowitz of Guckenheimer, and Drew Hedlund of Fleet Landing Restaurant & Bar in Charleston, SC. 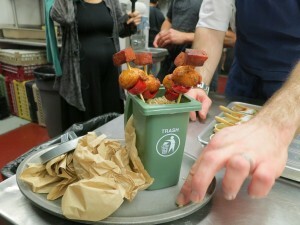 Larry served incredibly creative dishes – and even had miniature “trash cans” that he used in the presentation of the pollock brandade pintxo, piquillo pepper, and Spanish chorizo. Michael Leviton, chef/owner of Lumiere and Area Four, greeted guests and spoke a bit about the context for the evening, as well as the chefs’ reasoning for embracing the phrase “trash fish.” He underscored that seafood in New England is an urgent issue, and that chefs have a critical role to play in identifying seafood solutions. He went on to say that it was their hope that by hosting the dinner, they could help open up a meaningful conversation about the future of seafood – and showcase lesser-known, delicious species in a provocative way. It’s true, and chef Michael Scelfo, of Russell House Tavern in Cambridge, turned to monkfish when dogfish wasn’t turning up for his seafood supplier. Monkfish is a well-known former “trash fish,” that became popular in the late 80s and early 90s. And soon, monkfish is expected to be listed as a good fish alternative, rather than a species to avoid. Chefs plating Rich Garcia’s dish. After Michael spoke, Heather Tausig of the New England Aquarium shared words about trash fish and guests enjoyed initial courses of dogfish from Evan Mallett of Black Trumpet in Portsmouth, NH, and redfish from Mary Reilly of Enzo Restaurant & Bar in Newburyport, MA. Then, Rich Garcia of 606 Congress in Boston served up his much-anticipated Cape Cod blood cockle satay, and Jake Rojas of Tallulah on Thames in Newport, RI, served a beautiful Atlantic surf clam cocktail on the half shell. 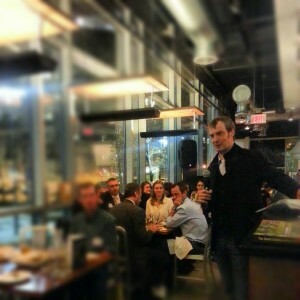 Barton Seaver addressing guests at the Dinner. After chef Michael Scelfo’s delicious pan roasted monkfish found its way to the tables, Derek Wagner of Nicks on Broadway in Providence, RI, finished the savory courses with a butter-roasted Atlantic pollock. Barton Seaver then joined the stage, and spoke about the economics of sustainable seafood. Barton is a Sustainability Fellow in residence at the New England Aquarium and National Geographic Society Fellow. 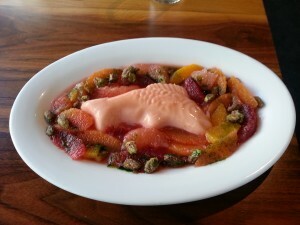 Michael Leviton’s trash fish dessert. Guests ended the evening with an incredibly creative dessert from Michael Leviton – a pink grapefruit mousse a la poisson, with winter citrus, peppered pistachios, mint. Plus coffee from Jim’s Organic Coffee. 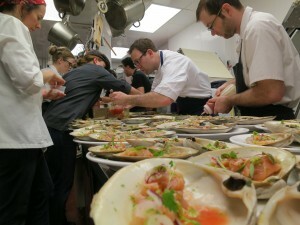 You can catch more photo highlights on our Facebook page, or on Twitter @chefscollab. Thank you everyone for your support, and for making last night a huge success!